Planning a trip to Sydney, Australia? 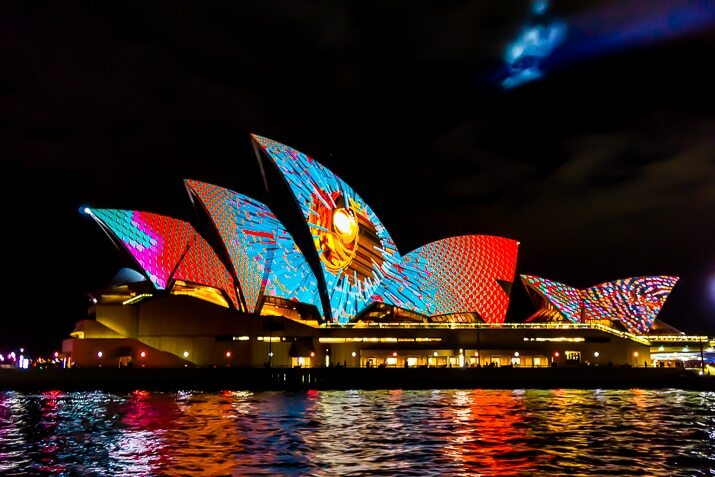 Make sure to go during the winter and plan your trip around Vivid Sydney for a festival of lights that can’t be missed! I always get excited every time I get to add a new continent or country to my menu bar, and this time, I get to do both! Earlier this month I spent a couple of weeks in Sydney, Australia and I have tons of stuff to share with you from my trip! But we’re going to start things off with one of the highlights! Now, I tend to be more of an off-season traveler. You won’t find me paying outrageous prices for flights and accommodations just to fight massive crowds, that’s just not my idea of a fun trip. My friend, Rachael, and I had talked about going to Australia earlier in the year but decided to wait until our summer, which happens to be Australia’s winter. And boy, was I glad we waited! 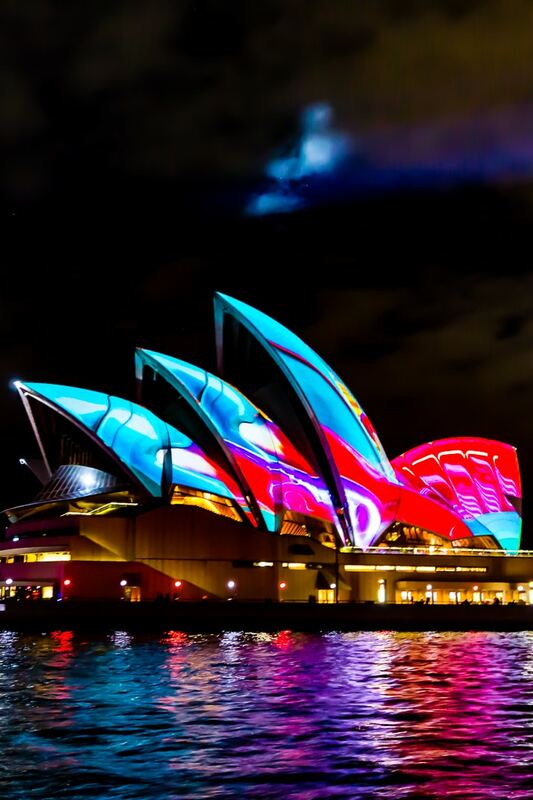 A few days before we got there we learned about Vivid Sydney, Sydney’s annual outdoor light festival! It was definitely a highlight of our trip and I think the only thing that could have made it better would have been doing our BridgeClimb at night while it was going on. Buy My Favorite Travel Backpack Now! But it’s not the lights themselves that make this event so amazing, it’s what the lights do, hardly any of them are stagnant. They’re all alive and moving and creating beautiful pieces of art. Many of the precincts in Sydney, even Taronga Zoo, have their own exhibitions that are interactive and beautiful. Many restaurants and shops will stay open later for these few colorful weeks in the middle of winter, and you’ll definitely want to sleep in a bit in the morning so you can stay out all night playing (and gawking) at the lights! 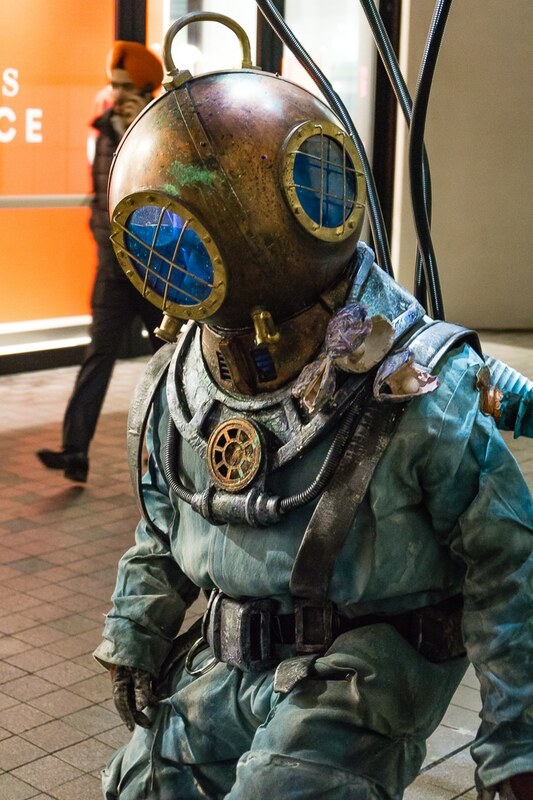 During Vivid Sydney, we took a Harbourside Cruise to take in the city from the harbour. 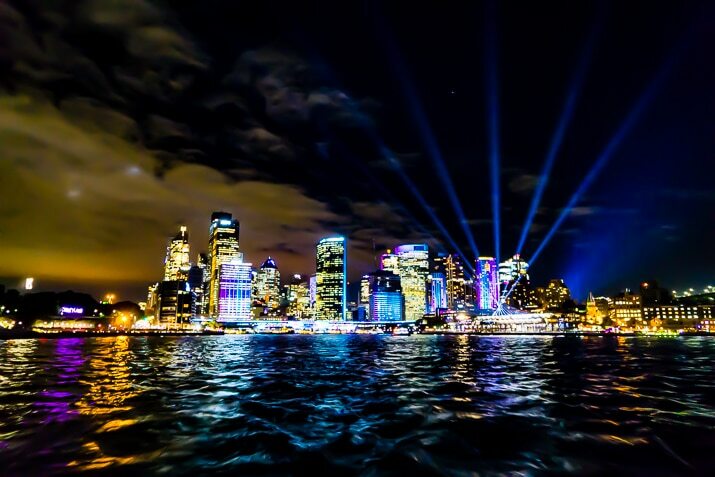 It’s the only charter cruise that can go into Circular Quay to take in the lights other than the transport ferries and water taxis. We really loved seeing the lights from the water, and most of these images were taken on the cruise, not bad for night time on a moving boat, eh? Get there early and be close to the front of the line to get on, there aren’t enough dining tables for everyone. Take Dramamine or bring Sea-bands if you get motion sick. Use a camera with a wrist or neck strap for safety, otherwise it might be a long rest of your trip without your phone. Don’t wear heels, the boat will be wet, rocky, crowded, and dark. Wear comfortable clothes and bring a jacket or sweatshirt. Usually the last few days of May through mid-June. 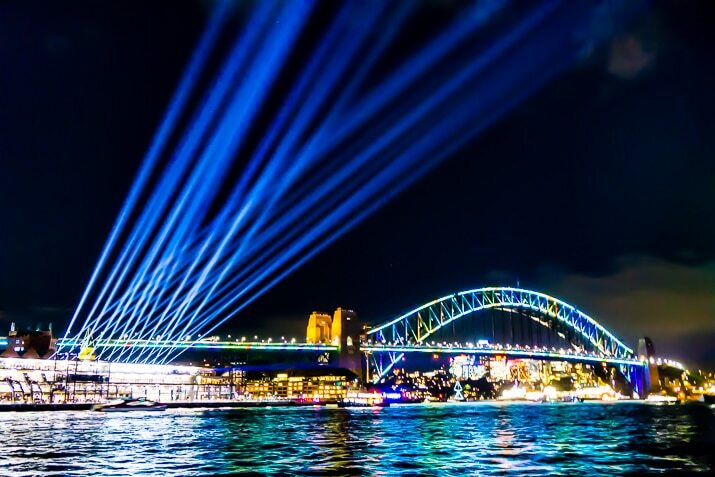 What Time is Vivid Sydney? 6:00 pm to 11:00 pm every night. 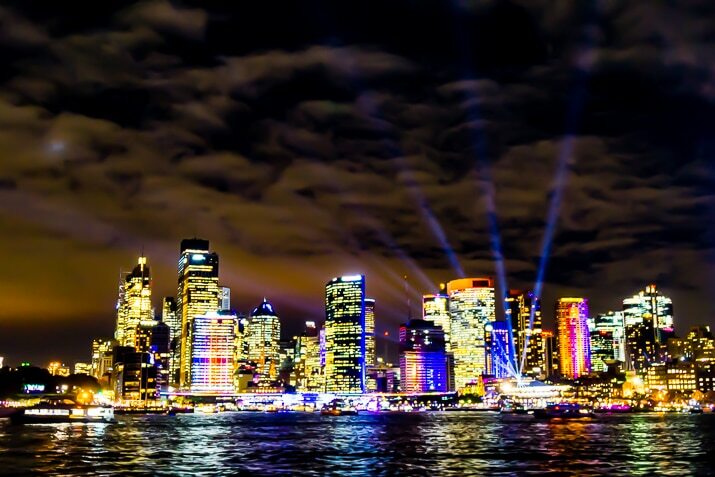 Circular Quay: If you’re not up for a full cruise but still want to take in the city lights at night, just use your Opal card and take the ferry across the harbour and back again. There’s also a few light installments in this area to check out and tons of restaurants between it and the Opera House to eat dinner at and take in the lights. Just keep in mind that it will likely be the first area in the city to fill up come dark. The Royal Botanic Gardens: Just the other side of the Opera House you find the gardens. They’re gorgeous during the day (even in winter), the installments here are quite fun and perfect for an evening stroll among the lights. Darling Harbor: This might be the area where there’s the most to do, if the Magicians of the Mist exhibit comes back next year, please go! Darling Harbor is filled with activity on an ordinary day so expect it to fill up fast with other light gawkers. 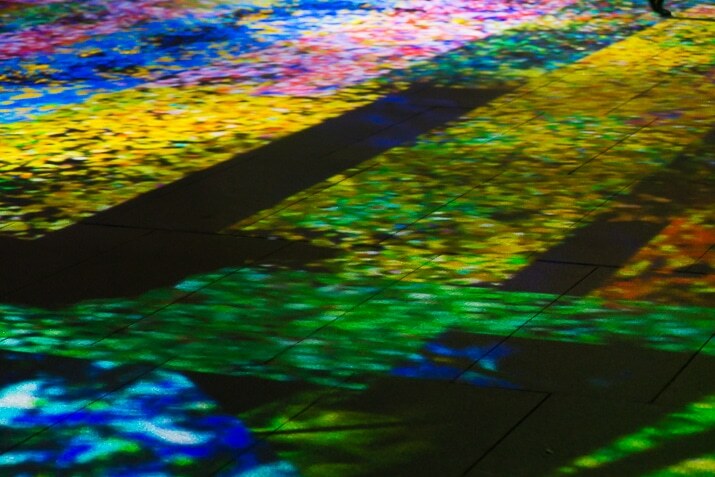 Barangaroo: Sydney’s newest area joined in the Vivid festivities for the first time in 2017 and it was probably our favorite. There are tons of great restaurants along the waterfront and several activities. And keep an eye out for the men down under (pictured above). The Rocks: The Glenmore’s rooftop barThis historic district is considered the birthplace of modern Sydney and there’s plenty to do there during Vivid. I would recommend grabbing a drink at to take in the lights. 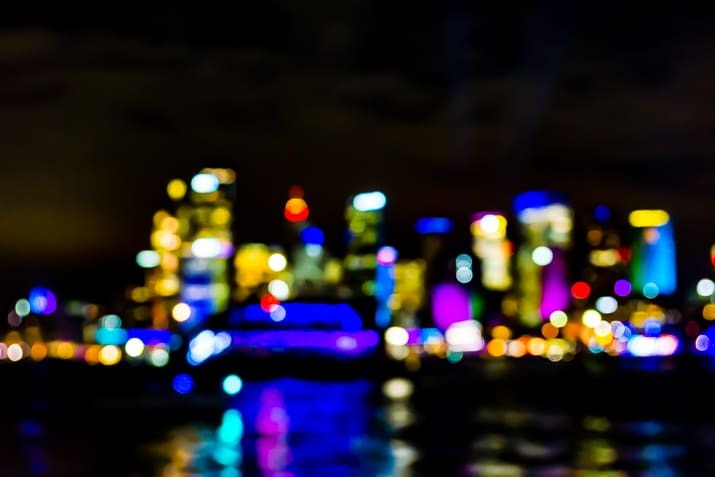 Milson’s Point: There really isn’t much going on in Milson’s Point for Vivid Sydney, but I dare say it’s Bradfield Park is the best spot to photograph the Sydney skyline in all its glory. The Sydney Harbour Bridge crosses from The Rocks into Milson’s Point, so you’ll have a bit of a panoramic view of the gorgeous glow of the city. 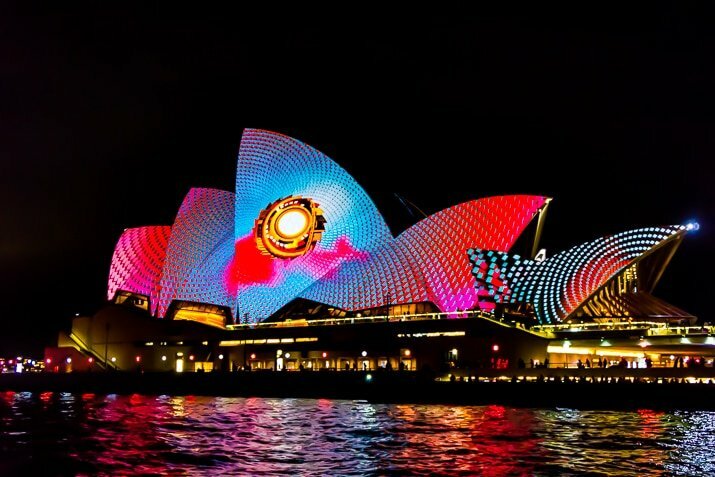 I think if I ever go back to Australia, I’ll definitely be going in the winter just so I can take in the magic of the city during Vivid Sydney again! Looking for more travel inspiration? Check out my favorite travel quotes and other great destinations!